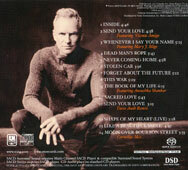 In Europe & Japan, the album was firstly issued on digipack, with an Hybird SACD. The track listing is not the same in every country, check Tracks listing for details. The SACD states "Stolen car", the normal CD jewel case issues state "Stolen car (take me dancing)". The SACD layer of the various versions of the Sacred love SACDs (hybrids) hold a much longer version of "Never coming home" than the one which can be heard on the normal CD audio layer. 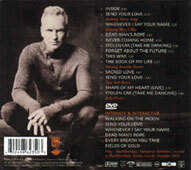 An EU tour edition of "Sacred love" was issued on May 2004 . 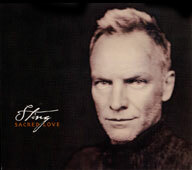 The new version features new cover art, the radio edit of "Stolen Car (Take Me Dancing)" and a DVD of Sting's Much Music performance. 5 UK 0602498605349 12 tx CD playing side states "made in UK", back sleeve states "Made in EU - not for sale in EU"
USA B0001934-19 11 tx DVD DVD audio, with 3 videos and long version of "Never coming home"
display France 57 x 156 cm Instore display, previous to hold CD.